Despite being highly contentious, the 2008 US Presidential Election resulted in an overwhelming electoral college victory by President Barack Obama. This map shows the difference in the number of mentions of Barack Obama and Republican candidate John McCain in user-generated placemarks indexed by Google. This peer-produced representation is remarkably similar to more official cartographic representations of the final election results, with a couple of notable exceptions. Because placemark concentration is correlated with large urban populations, even the states that overwhelmingly voted for Senator McCain seem to favor Obama. 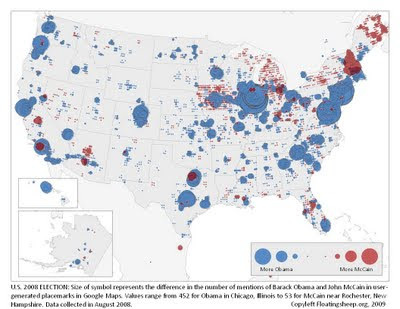 This concentration of placemarks in urban areas show a significant advantage for Obama, mirroring his successes during the election. Another anomaly is the red clustering in New Hampshire, a state in which Obama defeated McCain 54%-45%. However, this cluster can be explained by McCain's momentum-building primary win in the Granite State, which eventually propelled him on to the GOP nomination. Following J.B. Harley (1988), we should also take interest in the silences of this map. Here the primarily rural areas contain either no user-generated placemark information or an equal number of mentions for both Obama and McCain, but nonetheless appear uniformly devoid of content.